About 150 million years ago, Cuba was part of a submerged North American mountain range. Movements of the earth’s crust below the sea made the mountain tops appear above the surface of the water. These peaks became the Caribbean islands that we know today. During the 17th century, pirates buried stolen treasure on an island off Cuba called the Isle of Youth. According to legend, this was the famous Treasure Island described in Robert Louis Stevenson’s novel. 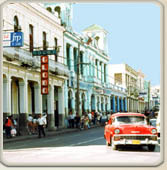 The name "Cuba" comes from the Taino word cubanacán, meaning a centre or central place. The royal palm is the symbol of Cuba. It occupies the central position in Cuba’s national coat of arms and symbolizes strength.